Menolly, musically gifted daughter of the Holders of Half-Circle Sea Hold, has run away from her oppressive parents, and is living holdless on the coast. For company, she has nine fire lizards she has accidentally impressed, and her songs. 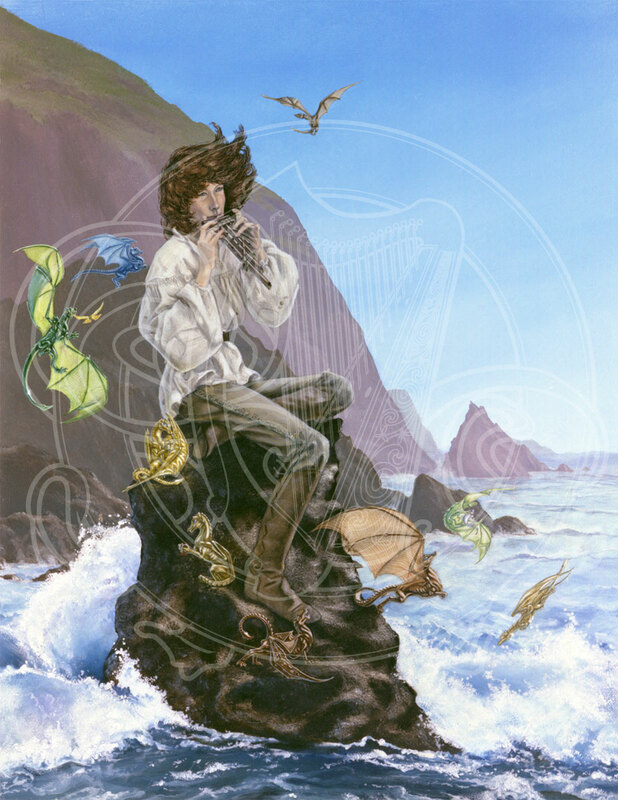 In this image, she is perched on a rock in the surf, surrounded by happy lizards, immersed in the harmonies she's playing on the pipes that she made. Hopefully, she'll notice at some point that the tide is coming in! This print is a companion piece to Sebell, since in the books they eventually marry. So, go to the Menolly print in the Zazzle store if you'd like to have this image on something!